(Newtown, PA – February 10, 2011) CenTrak, a leading provider of Real Time Location Systems (RTLS) for tracking equipment, patients and staff in healthcare facilities, today announced the release of its new IT-735 Probe-based Temperature Sensor Tag for use as a standalone solution or deployed along with CenTrak’s full RTLS asset and people-tracking offering. CenTrak’s Temperature Sensor Tags wirelessly track and report temperature levels of refrigerators and freezers in a healthcare setting, automating regulatory compliance documentation. The probes monitor a wide range of temperatures, from cryogenic (-200° C) to room temperature (+50°C), reliably and accurately with customizable reporting rates down to a few seconds and 0.50°C accuracy. The devices can generate alerts when the temperature deviates from preset parameters, and they provide automated 24/7 temperature logs that eliminate manual documentation and human error. Detachable probes make it easy to customize temperature ranges and facilitate trouble-free cleaning.Magee-Womens Hospital of UPMC recently deployed the new CenTrak Tags. improves patient safety: CenTrak’s Temperature Tags monitor refrigerators that store medications, blood and specimens to ensure that all remain at the proper temperatures. This level of tracking detail assures hospitals that drugs are dispensed to patients in compliance with guidelines and regulations. saves hospitals money: Fewer man-hours are required to manually track and report refrigerator and freezer temperatures. Furthermore, healthcare facilities are rescued from the potential catastrophic financial loss that could occur if certain medications, specimens, or blood products spoil because they have not been stored at the required constant temperature. is always reliable: Consistent with all CenTrak RTLS components, the Temperature Sensor Tag utilizes CenTrak’s patented DualTrak™ Technology resulting in battery life of 5 years at a standard read-rate. 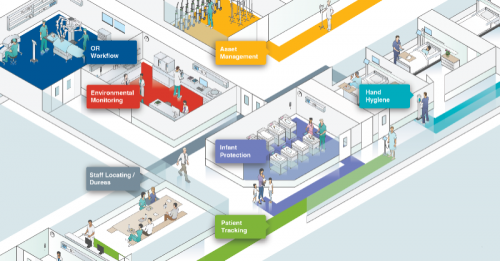 Hospitals can rest assured that their system is always is working. Should the network ever fail, the CenTrak Temperature Sensor Tags will cache data until the tags regain access to the system.